Secure a single trimmer quickly and easily. Also works great for pole saws. It’s fast and easy to use and it’s just as secure as our other trimmer racks. A standard padlock can be installed to help prevent theft. Constructed from a heavy gauge metal and powder coated for years and years of service. Constructed from a heavy gauge metal and powder coated for years and years of service. 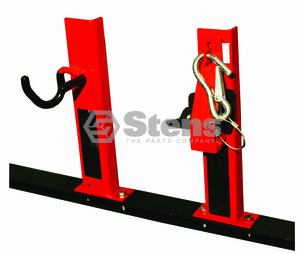 Ask us about the Stens 051404 Trimmer Rack. Please no repair questions. Your Q&A may be posted to Jackssmallengines.com to help other shoppers, like you, with their purchasing decisions. Thank you.